When you bring Indias and Thailands cuisines together in one recipe you will get this delicious soup! This pumpkin soup is very creamy, easy to cook and very tasty. 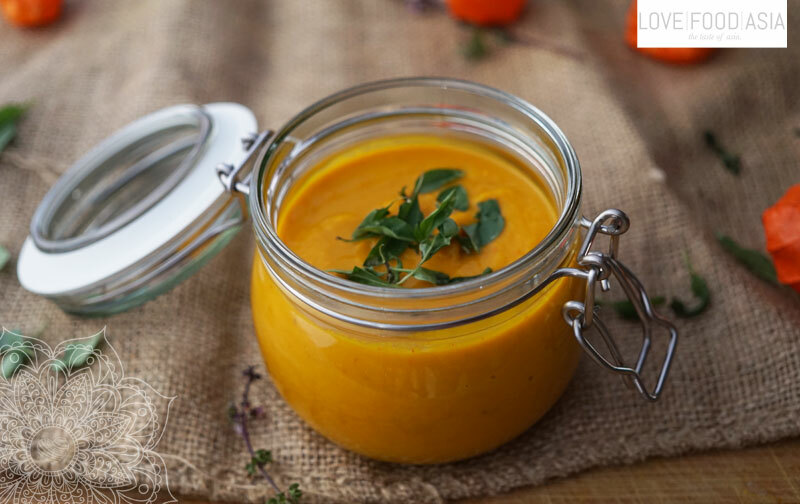 The Mango Chutney gives this classic soup it´s special flavour. Our fast to cook soup is also vegan, gluten- and lactose-free! Fry onions in oil until lightly brown. Add ginger, yellow curry paste, Mango Chutney and palm sugar. Let sugar caramelize and deglaze with sherry. Stir in carrots, potatoes and pumpkin. Stir fry for one minute. Pour in veggie stock until veggies are covered. Simmer for 15 minutes on medium heat. Pour in coconut milk and mix soup with a blender. Serve Pumpkin Soup with fresh Thai basil leaves.